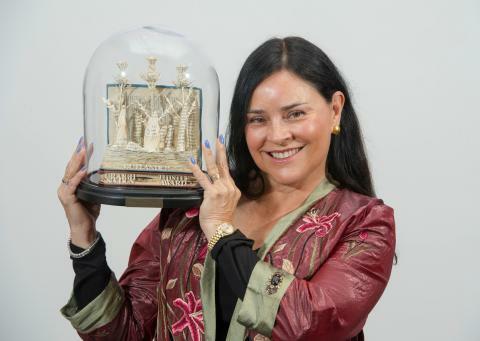 Diana Gabaldon was honoured at the Scottish Thistle Awards (14 March) for the effect her creation has had on Scottish tourism. 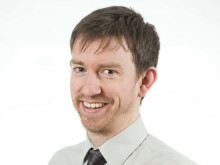 The Outlander author received the a special “International Contribution to Scottish Tourism” award from VisitScotland at the industry’s premier awards ceremony held at the Edinburgh International Conference Centre, to mark the 50th anniversary of the national tourism organisation. 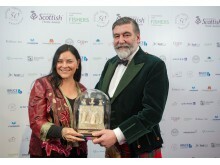 The American writer was presented the award by Lord Thurso, Chair of VisitScotland. The Outlander Effect & Tourism paper, published by the tourism body’s Insight team, reveals that attractions used in the popular television adaptation of her famous novels have seen visitor numbers soar by 67% since 2013, from 887,000 to 1.5 million in 2017. The special award was created by book sculptor, Thomas Wightman. 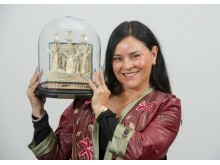 On receiving the award, Ms Gabaldon said: "It's fabulous. I hear a great deal from fans of mine who have read the books and seen the TV show who come to Scotland, because they all write to tell me how wonderful it was and they send me souvenirs of their trips. "I have a stack of postcards as well as a small number of Loch Ness monsters scattered around the house."